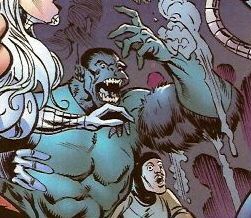 History: (Code of Honor#3) - While many heroes were snatched from Earth by the Beyonder, three criminals somehow got their hands on the equipment of the deceased Ani-Men and used it to rob a vault wagon only to be opposed by the NYPD. (Civil War: War Crimes#1) - A new set of Ani-Men were among the many criminals contacted by Hammerhead in an effort to take over the underworld while the Kingpin was incarcerated. Unbeknownst to them, Kingpin had tricked Iron Man into leading a SHIELD unit to the warehouse where they were meeting, with Iron Man believing it to be the headquarters of Captain America's "Secret Avengers." Iron Man and the SHIELD unit busted in, and a huge fight broke out. The battle resulted in arrests, injuries and death, but it is unrevealed if any of those applied to the new Ani-Men. Comments: Created by Chuck Dixon, Bob Wakelin, Derick Gross and Paul Lee. Frank Tieri, Staz Johnson, Tom Palmer & Robin Riggs. I didn't see a Frog-Man, but that doesn't mean he wasn't around either. The above assumption became a fact when it was revealed in Iron Manual Mark 3's Ani-Men profile. Profile by Madison Carter & Markus Raymond. 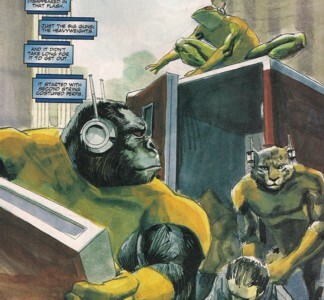 After Iron Man and the SHIELD agents arrived, Ape-Man tossed a few of them around.